Murray Equipment Sales, Inc. is a manufacturer’s representative of industrial fire protection equipment. We proudly represent the industry’s leading companies with a long history of outstanding consumer products. From his start in 1985, our key founding partner Brad Murray has been involved in selling fire protection products. In 1992 he received the first of several National Sales Leadership Awards from Fairbanks-Morse Pentair Pump Group. His unparalleled industry knowledge continues to lead the company in sales and services throughout Florida. Founded in 2002, our company has always strived to pair knowledge of industry products with a level of reliable sales and services for our customers. Our goal is to offer our customers the most preferred Fire Protection Products and Services for application within new or existing projects. A global leader in storage tank systems, Tank Connection steel products are paramount in the industry. Their Fire Protection RTP bolted tank is designed to meet Factory Mutual and NFPA22 requirements and remains unmatched in the industry. 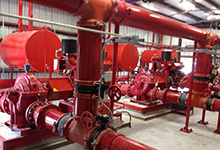 With product lines that have been an integral part of the global industry since the late 1800's, Fairbanks Morse Fire Pump Group has the most complete line of fire pumps available. Their fire pumps come with a capacity ranging from 25 GPM to 5000 GPM, electric or diesel, available horizontal, vertical inline, vertical split case or vertical turbine. Founded in 1937, Potter Roemer has become a leader in the fire protection standpipe industry. Potter Roemer products include valves, FDC, and fire hose cabinets, rated and non rated; a complete line of hose racks, hose reels and specialty products. 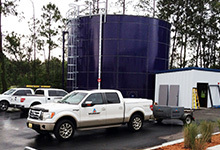 Our company also provides quality and knowledgable flow testing services which are required to be preformed by NFPA 25 standards. 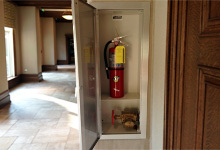 Compliance helps maximize system integrity to avoid failure and ensure fast, effective response in a fire emergency.